What if walls could talk? Better yet: What if you could hear them, and look into the past, present, and future like never before? The Amazing Kids! Mystery Interviews, is a series that takes you on a journey with things that usually don’t talk. Read our interview for this issue and keep your eyes peeled for clues. Go to the bottom and check out the “Who Am I” section for the final dish on our inanimate interviewee! AK: So I hear your population is pretty stable, am I correct? AK: How many of you are still out there? KD: Hmm. I’d have to say at about 3,000. AK: Ahh. Do you happen to know why your population is so stable? KD: A very good question. I would have to say… probably because my species lives on uninhabited islands, meaning no people live there. AK: Is it a good or bad thing that the islands are uninhabited? KD: I’d have to say it is good. As I said before, our population is very stable, and there’s no human species around to bother us or anything – no offense. AK: None taken. What do you eat on your island? KD: My species will eat anything we can catch and/or overpower; we’re not very picky. We also hunt small mammals, nesting birds and insects. We eat smaller ones of our kind, if it comes to that. AK: If you had to pick, what is your favorite food? KD: My favorite prey would have to be wild pigs, deer and monkeys. I also do like carrion, which is dead flesh. AK: Sounds like a yummy diet… so about those uninhabited islands. Where are they? KD: The uninhabited islands? Oh, you mean the ones we live on. I’ve heard people call them the Indonesian islands. AK: Oh, I see. Now… are you land creatures or sea creatures? KD: Both. We are fast moving and agile on the ground, but we are also very good swimmers. 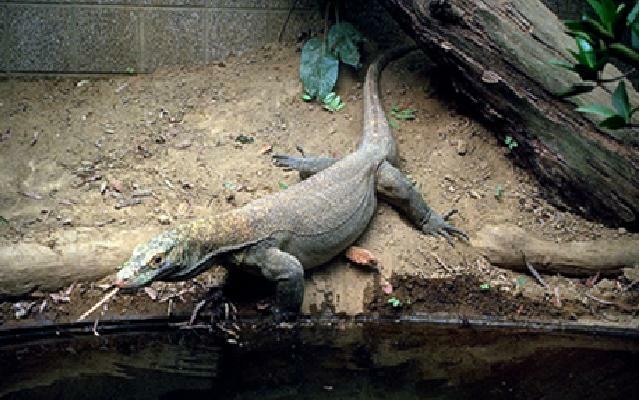 The Komodo Dragon has a stable population of about 3,000; the population is probably so stable because the species lives on the Indonesian Islands, which are uninhabited. Their diet consists of anything they can catch and or overpower, smaller Komodo Dragons, wild pigs, deer, monkeys, carrion (dead flesh), small mammals, nesting birds, and even insects. 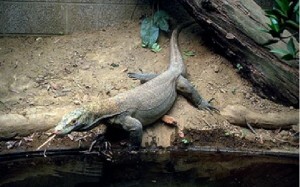 The Komodo Dragon is a land and sea creature; it is very fast and agile on land but also a very good swimmer.